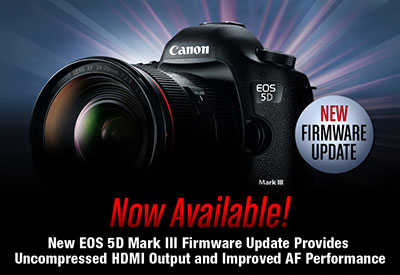 The new Firmware 1.2.1 for the EOS-5D Mk III is available for download at Canon's website. You can read more about the new software by clicking on the link above. I am most impressed by the AF at f/8 feature. Up to now, only the professional EOS-1D bodies have this capability. Canon should add this feature to the upcoming EOS-7D Mk II camera as well. Once the EOS 5D Mark III camera is updated to version 1.2.1, it cannot be restored to a previous firmware version (Version 1.0.7 through 1.1.3). 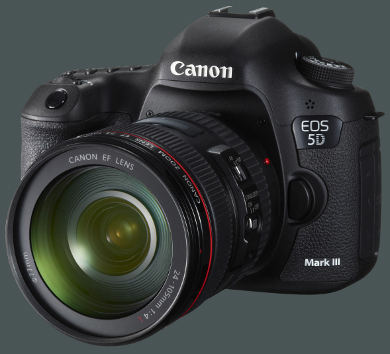 It is recommended that the latest application software*1 be used, once the EOS 5D Mark III is updated to the new firmware version 1.2.1 from older firmware (versions 1.0.7 through 1.1.3). Certain previous versions of these applications do not support functions which are added by the new firmware. When cameras, or images taken with cameras that have been updated to the new Firmware Version 1.2.1 (or 1.2.0), and are used with the old version application software, the following phenomena will occur. The "HDMI output" function, "HDMI output setting" or "HDMI output frame rate setting" cannot be registered to My Menu of the camera. 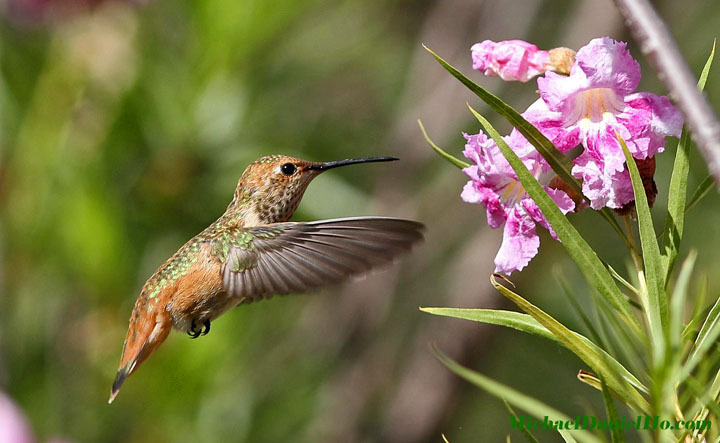 The lens aberration compensation data cannot be registered to the camera. If the Lens Aberration Correction Window is chosen when working with a RAW image taken with a camera running Firmware Version 1.2.1 or 1.2.0, the adjustment window will automatically shut down and the adjustment (correction) cannot be made. 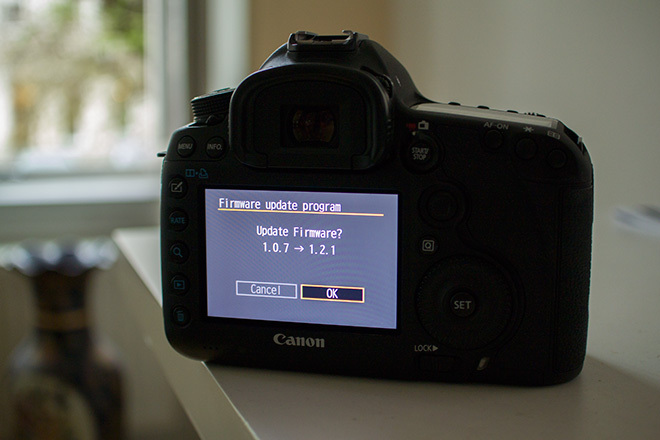 Due to the differences in the camera firmware versions, the following phenomena will occur. 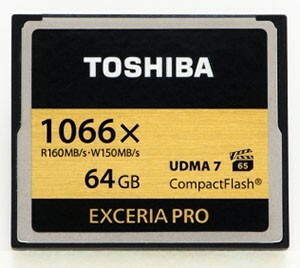 RAW images taken with a Firmware Version 1.2.1 (or 1.2.0) camera cannot be processed on cameras with Firmware Version 1.1.3 or before. When images taken with a camera running Firmware Version 1.2.1 (or 1.2.0), are read by a camera running Firmware Version 1.1.3 or older, Direct print is not possible. Accompanying the enhancements to the functions, the instruction manual has also been revised. Users are asked to download both the latest firmware and the instruction manual. You can download the latest instruction manual from Canon's website. Canon is expected to be busy the second half of 2013 announcing a few new lenses and perhaps a couple of DSLR bodies as well. 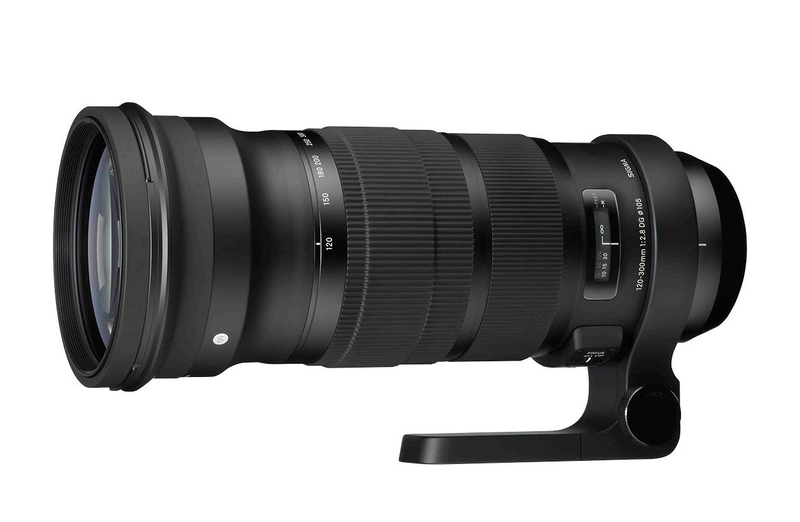 One of the long-rumored lenses expected to be released is the EF 100-400mm f/4-5.6L IS L II. 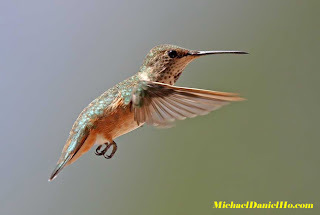 The current lens has been around since 1998 and showing its age, although it is still a top performer for me and one of my favorite wildlife lenses. Read my earlier post on Canon lens recommendation. Nikon recently released their 80-400mm VR AF-S lens and now Canon may be ready to response, perhaps some time in mid summer by announcing the EF 100-400mm replacement. The new lens is expected to be slightly faster (f/4) on the short end and tops out at f/5.6 on the long end. 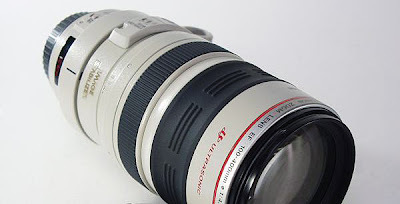 Prototypes have been sighted in Asia on field tests and no specifications have been leaked but the weight and price are expected to higher, perhaps around 3.5 pounds and roughly the same list price as the EF 28-300mm f/3.5-5.6L IS, at $2,689. The Japanese Yen has weakened dramatically in the last few months, a strategy engineered by the new government in Tokyo. Canon has forecasted a big increase in their net profit for the fiscal year of 2013, not from increased sales but from the depreciated Yen. Once Canon has finalized their design and manufacturing processes, they should be able to move to capitalize on the 'cheap' Yen and start releasing more new products. Canon U.S.A., Ron Howard And Bryce Dallas Howard Announce "Project Imaginat10n" Film Contest Where Five Consumer-Directed Films Will Premiere At The "Project Imaginat10n" Film Festival In the Autumn of 2013. Now the Public Can Select 10 of the Winning Photos from Project Imaginat10n to Inspire Short Films, the same Creative Exercise as Eva Longoria, Jamie Foxx, James Murphy, Georgina Chapman and Biz Stone. MELVILLE, N.Y., April 24, 2013 – Canon U.S.A., Inc., a leader in digital imaging solutions, announced today the "Project Imaginat10n" Film Contest, which will provide the public with a unique opportunity to showcase their creativity and storytelling abilities by taking a seat in the director's chair. Helmed by Ron Howard and Bryce Dallas Howard, filmmakers of all skill levels will each have the chance to embark on the same creative exercise as five celebrity directors - Eva Longoria (film and TV actress), Jamie Foxx (Academy Award(r) winner), Biz Stone (co-founder of Twitter), Georgina Chapman (designer and co-founder of Marchesa) and James Murphy (founder of LCD SOUNDSYSTEM) - all of whom are directing short films inspired from ten Project Imaginat10n winning photographs. Selecting from the same pool of 91 winning photos, the challenge is to create a short film inspired by ten crowdsourced photos and based on ten storytelling themes: Character, Mood, Goal, Backstory, Setting, Obstacle, Relationship, The Unknown, Time and Discovery. The Discovery photo will be the same in each film, "Discovering limits," as selected by Ron Howard as a thematic tie. All 91 photos can be seen at imagination.usa.canon.com. In 2011, Bryce Dallas Howard took part in a similar creative endeavor, "Project Imagin8ion," where she was mentored by her father, Ron Howard, to create a short film inspired by photographs. After selecting eight winning photos, Bryce directed "when you find me," an award-winning film about two sisters whose childhood bond is tested by a tragedy they are too young to understand. As the first "graduating" director of the Project Imagin8ion experiment, Bryce will utilize her experience from "when you find me," to act as a mentor for other filmmakers - speaking at select film schools and revealing her tips in an online webisode series, "Bryce's Project Imaginat10n Film Contest Tutorial." "Directing 'when you find me' was one of the most creatively rewarding endeavors of my career. In addition to the amazing experience of being mentored by my dad, the chance to collaborate with such a vast community of artists and photographers was game changing and challenged the very paradigm of the filmmaking I had grown accustomed to," said Bryce Dallas Howard. "My hope for the Project Imaginat10n film contest is that aspiring filmmakers will feel empowered to showcase their work and explore their own creativity. I'm thrilled to have this opportunity to engage with the filmmakers and support them as they embark on this powerful odyssey into creativity and collaboration." Submissions will begin on June 4, 2013 at Imagination.usa.canon.com (see Official Rules for details). A panel of judges will select twenty finalist films based on overall technical quality, originality, use of imagination and impression. Bryce Dallas Howard and Ron Howard will then select the final five winning films and package them with the five celebrity-directed films as "A Ron Howard Presentation." All ten films will be showcased at Canon's Project Imaginat10n Film Festival in the Autumn of 2013. 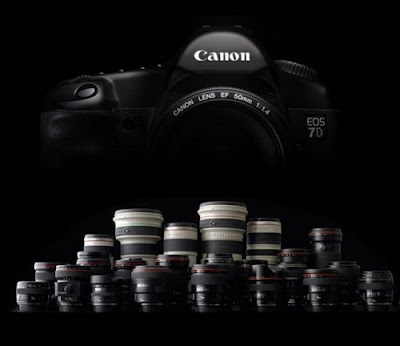 Canon has delayed the announcement of the EOS-70D camera until June, 2013. The reason may be because they have yet to finalize which sensor to put in the new camera. Originally, we were led to believe the new EOS-70D will share the same sensor as the recently introduced EOS Rebel SL1, the world's smallest DSLR camera. 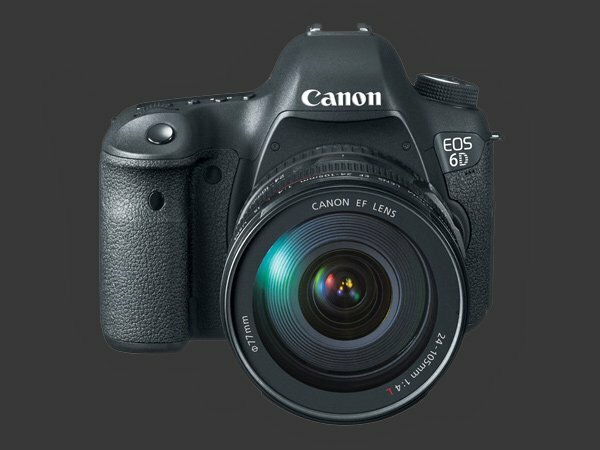 Now it seems Canon is trying to decide whether the 70D should share the same sensor as the upcoming and long awaited EOS-7D Mk II. Since the EOS-60D is powered by the DIGIC 4 processor, the EOS-70D will most probably be powered by the DIGIC 5. Canon likes to introduce their newest processors on the Rebel line of cameras first, so I would expect DIGIC 6 to come out on the next Rebel camera. 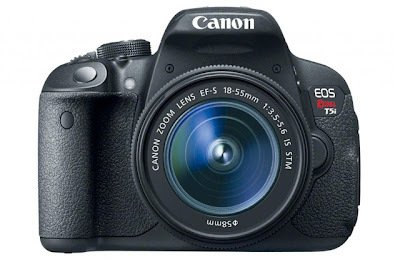 For the record, Canon had introduced the DIGIC 6 processor in the PowerShot SX280 camera recently. 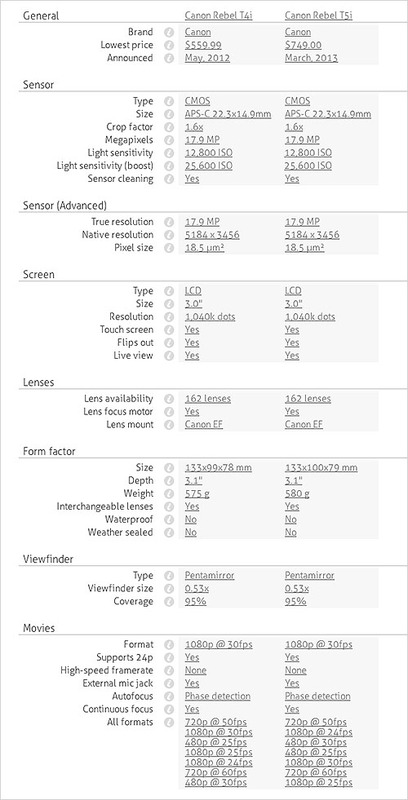 There may be a new EF lens accompanying the 70D's introduction. Once the official announcement is made, delivery should commence in about one month. Check back for more updated information as they become available. 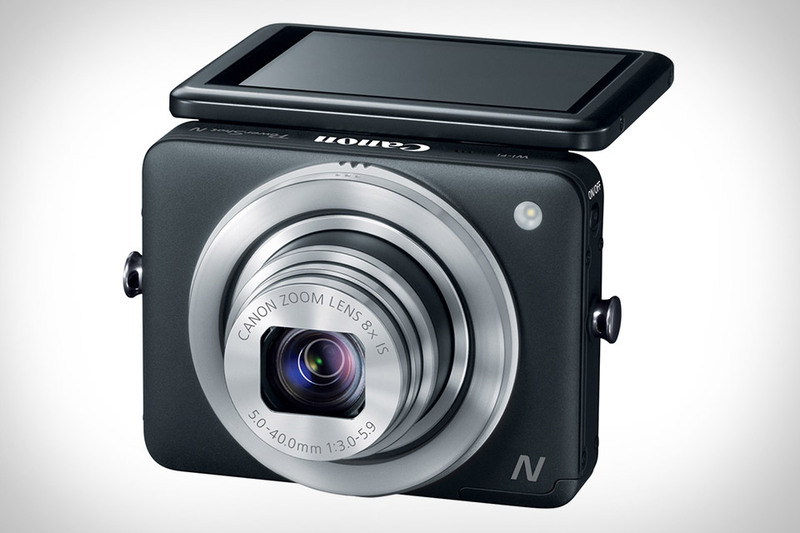 The Canon Camera Museum has published a technical report on the PowerShot N camera. I quite like this little point-n-shoot camera. The design is new and interesting. 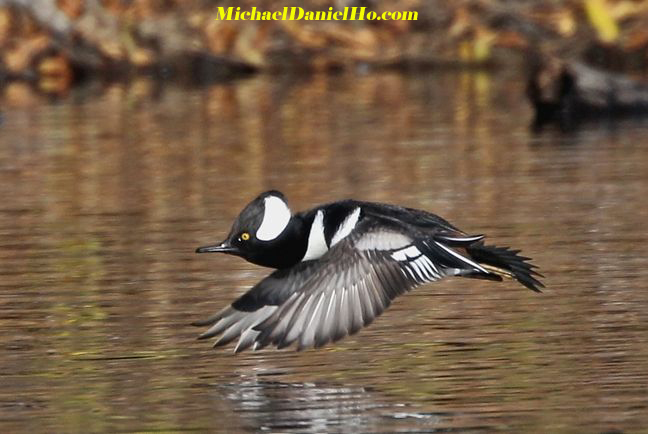 One of the many joys of watching wildlife is to see birds in flight. 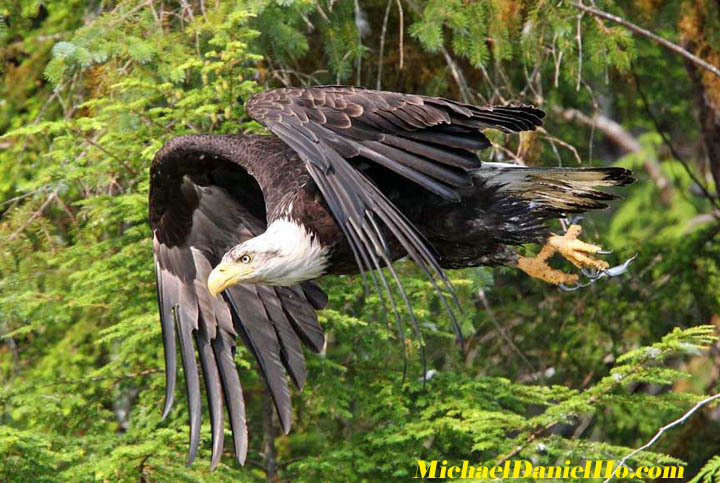 An even greater excitement is to capture them on a photograph while they are in the air. I use Canon equipment and handhold my camera when I photograph birds in flight. It gives one maximum mobility and flexibility provided one knows which technique and equipment to use, when and where to use them. 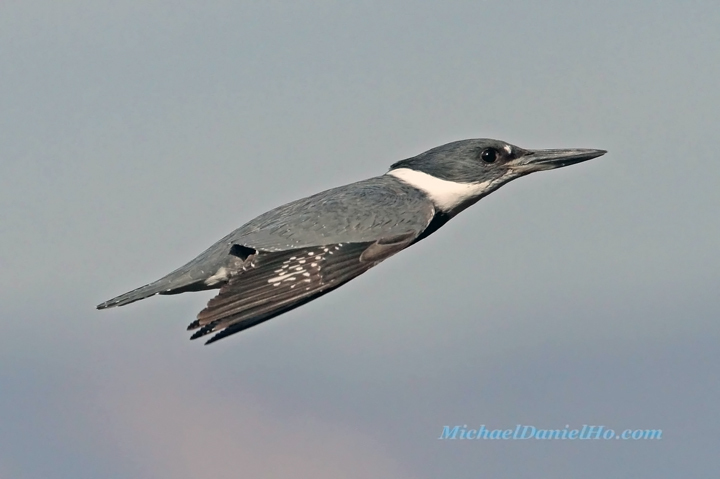 There are three Canon bodies in my bird photography bag : EOS-1D X, EOS-1D Mk IV and EOS-7D. The lenses I use varies with the particular situation but most of the time, I use the EF 200-400mm f/4L IS, EF 100-400mm f/4.5-5.6L IS, EF 400 f/4 DO IS and EF 400mm f/5.6L. 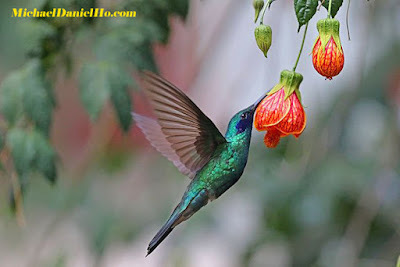 If the light is really bad and I am close enough to the birds, I will employ the EF 70-200mm f/2.8L IS II. Only occasionally will I add an extender to the lens because I prefer to position myself closer to the action if possible. All three cameras work well depending on the action, distance and speed of the birds. As my readers know by now, I have picked the EOS-7D as the best overall camera value three years running and the EOS-1D X as the best wildlife camera on the market today. You can read my review here. 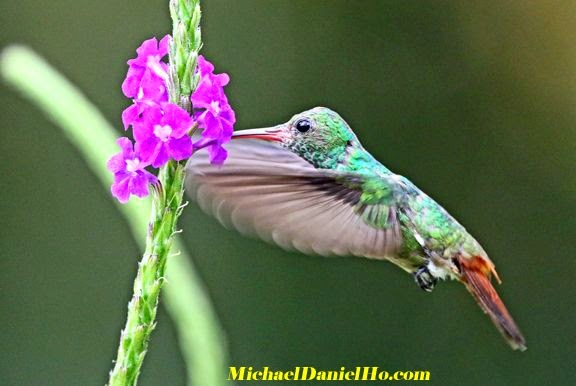 Like almost everything in wildlife photography, three things matter the most - skill, equipment and luck, not in any particular order. Take a look at my post on equipment recommendation and wildlife photography tips to get more information. You can also visit my bird photography page on my website to see many more birds from all over the world. In my earlier post, I questioned the wisdom of Canon introducing a 'new' Rebel camera almost every year. 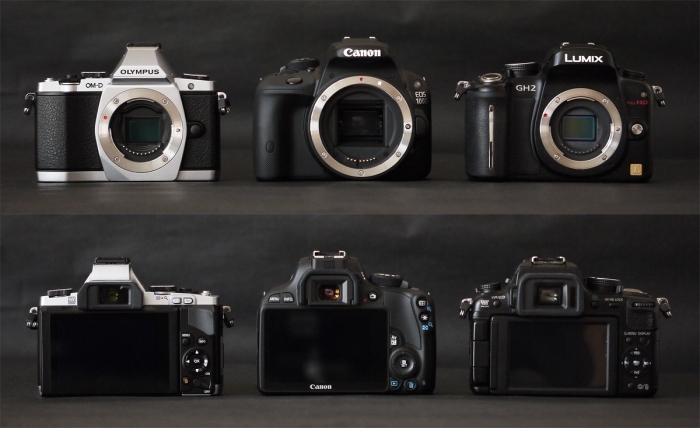 The above chart speaks volumes about the Rebel T5i and the Rebel T4i cameras. You can judge for yourself. Like I said before, the recent Canon new cameras are at best sleepers. It is better to have no new products than to over promise and under deliver on new introductions. Slick marketing brochures and glib sales chatter can only go so far. Bring out the new Canon EOS-70D and EOS-7D Mk II cameras and tell the photography world when the megapixel successor to the EOS-1Ds Mk III camera, the EF 200-400mm f/4L IS 1.4X lens and a few other 'L' lenses being field tested, will come out. That would be news worth having instead of releasing a really small DSLR or another 'new' Rebel for 2014. 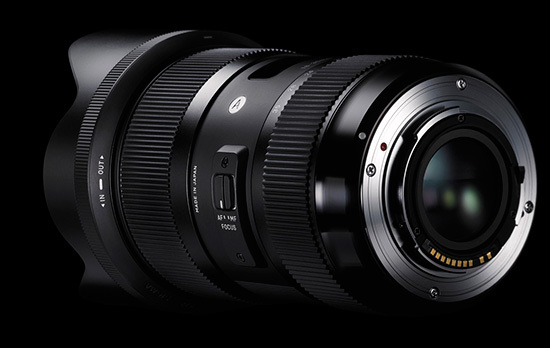 Sigma Corp. has been announcing new and exciting lenses this year. Read my latest post on this topic here. When will Canon step up to the plate and start announcing some of their long awaited new lenses? RONKONKOMA, N.Y., April 24, 2013 - Sigma Corporation of America, a leading researcher, developer, manufacturer and service provider of some of the world’s most impressive lines of lenses, cameras and flashes, today announced the pricing and availability of the Sigma USB dock and the company’s newly redesigned 120-300mm f/2.8 DG OS HSM from the Global Vision Sport lens category. The updated 120-300mm f/2.8 DG OS HSM lens will be available in early May for the street price of $3,599 in Sigma and Canon mounts. The USB dock, which is compatible with lenses from Sigma’s new Global Vision lineup, will also be available in early May for the street price of $59. With redesigned mechanics and performance, this Sports lens is an update from its predecessor released in February 2011. With a maximum focal length of 300mm and a wide-open aperture of f/2.8, this lens eases difficult shooting conditions. It is dust and moisture resistant, and allows users to switch between two custom settings created via the USB dock. The 120-300mm lens has been redesigned and quality-control tested with Sigma’s proprietary modulation transfer function (MTF) “A1” measuring system as part of Sigma’s new Global Vision category restructuring. Under the new Sports category, the lens also has the manufacturing year stamped on the barrel. You can read more about the lens here. The Sigma USB dock, an industry first, works in conjunction with Sigma Optimization Pro (SOP) software to connect a photographer’s lens to their personal computer and the internet to update firmware and other parameters. The AF speed, focus limiter and OS function are also customizable for Sports lenses, such as the 120-300mm f/2.8 DG OS HSM. Upon arrival of the products, SOP will be available via a downloadable copy online here. A video demonstration of SOP software is available here. DxO Optics has added 118 new lens / camera combinations to their Modules library, providing support for Canon, Nikkor, Sigma, Tamron and Tokina lenses for Canon, Nikon and Sony cameras. To see supported and planned combinations, click on the DxO link to access their website. CareerCast's annual list of the best and worst jobs are out again and they show one of the worst paying jobs belongs to photographers. The 200 best and worst jobs in the U.S. in 2010 was calculated based on five criteria - environment, income, employment outlook, physical demands and stress. 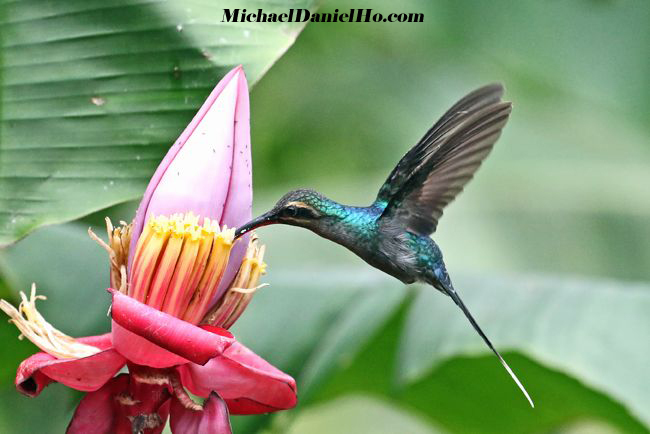 Personally, I have exchanged my job as a banker for a life of travel and wildlife photography two decades ago and find it most rewarding and stimulating. 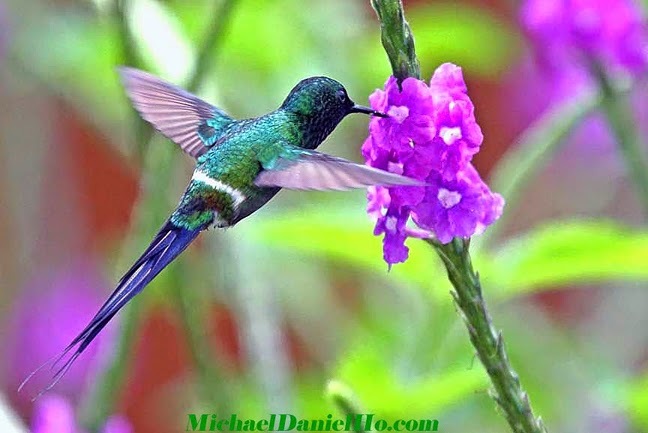 One must believe in and enjoy what one does and that is the greatest reward of one's work. 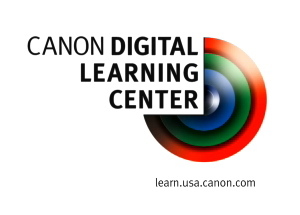 Canon Digital Learning Center has put out a series of four tutorial videos. Explorer of Light, Mr.Vincent Laforet explains the basics of time lapse photography in this beautiful series. Travel with him from the rugged canyons of Utah to the Las Vegas Strip, and learn how to make your own unique time lapse movies. 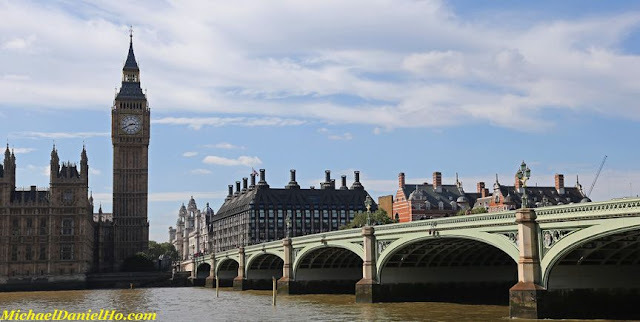 You can view the videos by clicking on the Canon website here. 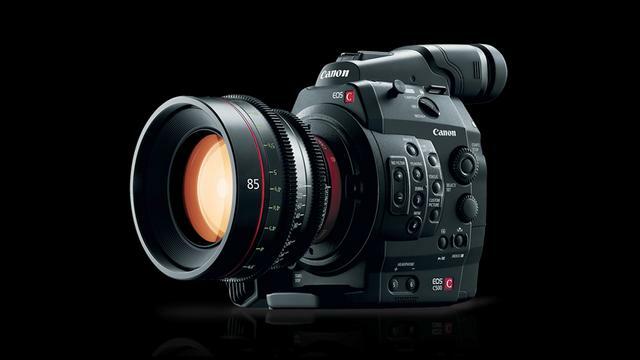 Canon U.S.A. has launched the Cinema EOS C500 4K Digital Cinema Camera Menu Simulator. Developed by the Canon Digital Learning Center (CDLC), the EOS C500 Menu Simulator is a fully interactive platform that allows users to familiarize themselves with the camera’s Main Menu and Custom Picture Menu. With this innovative training tool, prospective users of the EOS C500 can navigate the simulated menu system with a mouse, keyboard arrow keys or their fingers (when using a touch screen device). Ideal for cinematographers, camera operators, camera assistants, producers, and directors, the Menu Simulator provides a platform to research camera behavior and features. For added convenience, the EOS C500 Menu Simulator has been optimized for use on personal computers and tablet devices so it can be used at home, on set, or on-the-go. To access this simulator feature, visit this link on the Canon website. 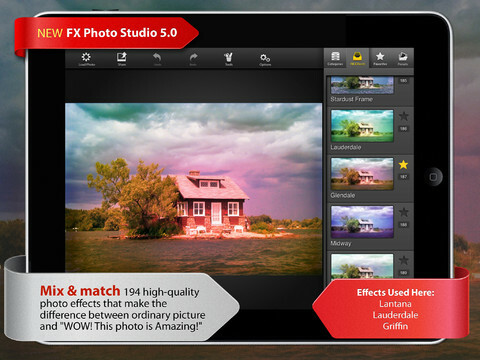 FX Photo Studio HD for the iPad and iPhone is being offered without charge (download from Apple here) for a limited time. This is an interesting App and is quite useful for on-the-go mobile photography. Hands down, the best variety and one of the largest collections on App Store, including Lo-Fi, art, frames, vintage, graffiti, tilt-shift, blurs, grunge, textures, black&white, sketches, pixelate and more. You can customize each effect and tune it the way you like. Plus you can apply as many effects on one image as you like, creating new unique photo filters. FX Photo Studio brings you the most powerful color splash tool available for iOS. You get a fully customizable brush, powerful zoom to work with details, possibility to preview masking and more. You don’t need any other app to create photos with selective colors. You can apply effects to the whole image or just a part of it. With over 190 photo effects and masking tool, your creativity is truly unlimited. You can upload images from iTunes, Camera roll or even your Facebook albums. You can share creations via most popular social networks, including Instagram, Flickr, Facebook and Tumblr. 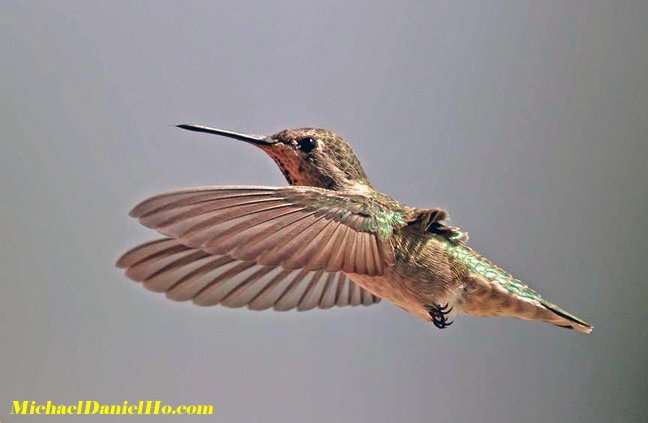 You will be amazed how intuitive FX Photo Studio is. 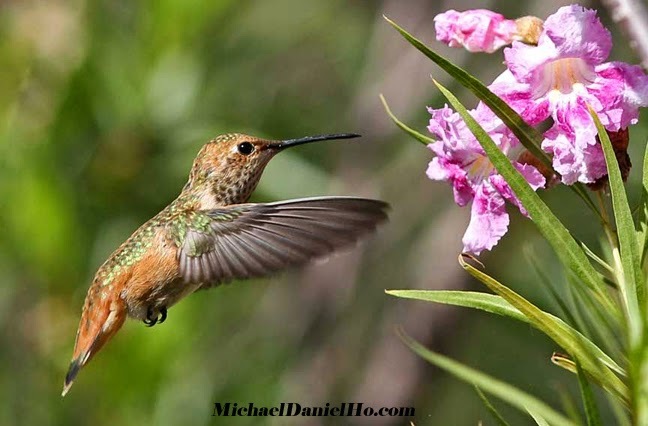 You do not need any special knowledge to make amazing photos – everything is made with just a tap or two. 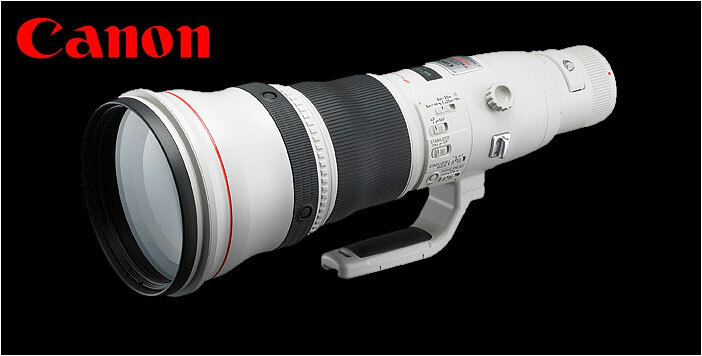 Canon announced the development of the EF 200-400mm f/4L IS 1.4X super telephoto lens over two years ago. 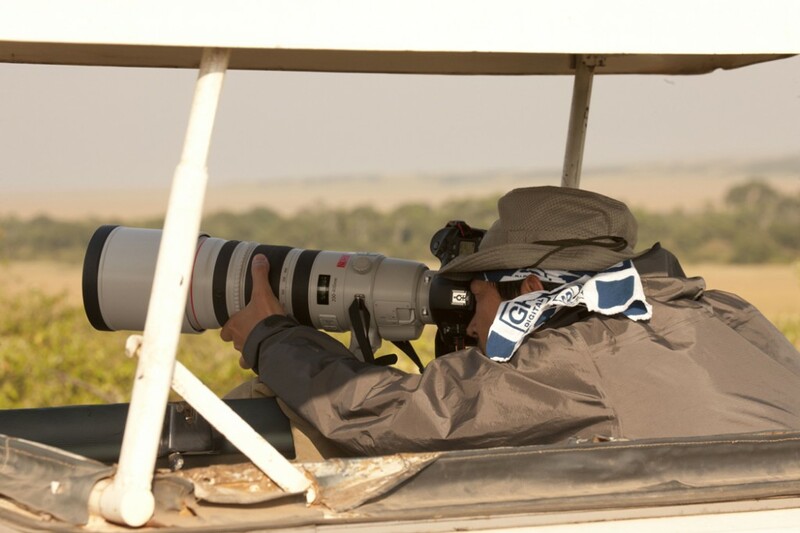 Since then, this lens has been around the world on many field tests and spotted on all continents, perhaps except Antarctica. All the basic features about the lens have been well known. 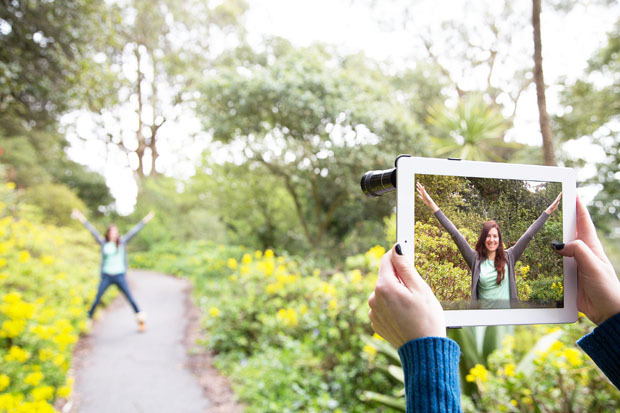 It has a built-in 1.4X extender and can be turned on with just a flip of a switch. On the left side of the lens, one finds the switch panels. 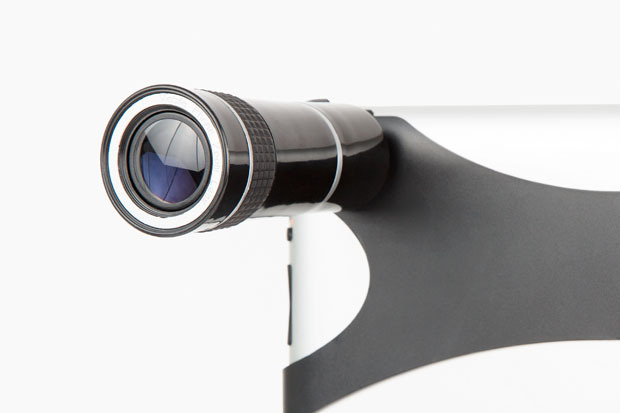 The stabilization button is the same as the current Series II super telephoto lens : the classic mode 1, mode 2 for panning and the new mode 3 that works only during the exposure. 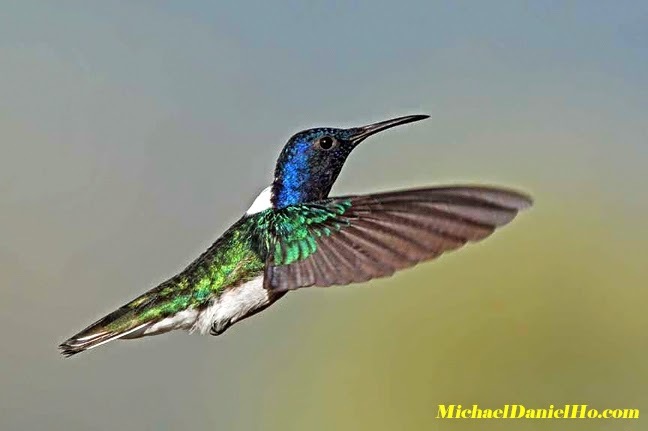 The minimum focusing distance is about 6 feet and the image stabilizer is very effective, relatively sharp photos can be obtained even with 1/40 to 1/60 of a second shots. The lens also accepts external extenders. 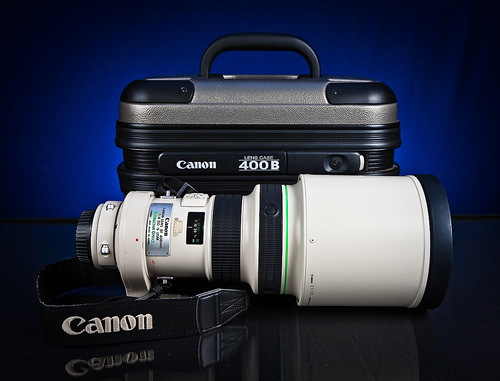 Mounting the Canon EF 2.0X will give you the equivalent of a EF 400-800mm lens. Although not completely finalized, the dimensions of the lens are similar to the current EF 500mm f/4L IS II, approximately 5.7 x 15.1 inches but the weight is expected to be slightly heavier, perhaps weighing around 8 pounds. 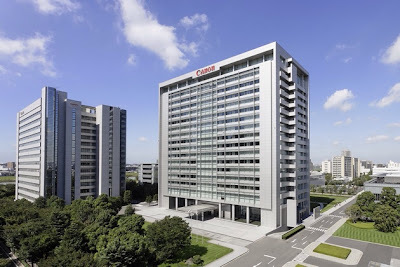 Canon will not permit any photos taken with the test versions of the EF 200-400mm f/4L IS 1.4X lens to be published but there is no reason to believe it will not deliver stunning images, just like the current Series II lens. All the previews of the lens are positive. You can see a video and hands-on preview of the lens in my earlier post here. So the burning question is, 'When will this lens be officially released for sale?' I am hoping it will be some time in the latter half of 2013 but of course it can slip into 2014. Canon should issue some progress report on this lens. The saga continues on the most tested, spotted but still unavailable lens in history. The world is waiting impatiently. Sigma has recently announced their 18-35mm f/1.8 DC HSM lens. This is the world’s first lens that offers a fixed f/1.8 aperture throughout its zoom range. The fixed f/1.8 aperture breaks new ground in the camera lens industry, as the zoom lenses of Canon and Nikon top out at f/2.8. This Sigma lens offers more than a stop of extra light. Read the Sigma official announcement on their website and see sample images here. 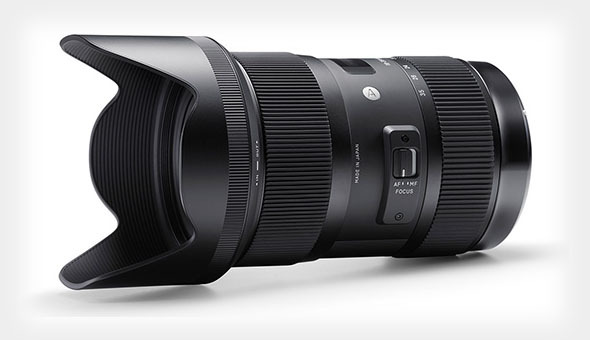 It seems Sigma has embarked on an aggressive new lens program for 2013. The next ART lens to be announced may be the 135mm f/1.8 DG OS, together with the 24mm f/1.4 and 50mm f/1.4 plus an additional lens. They are also working on a fast ART lens for full frame cameras. As you probably know, Sigma currently has the most powerful zoom lens on the market, the 200-500mm f/2.8 APO EX DG. Sigma is getting to be a very innovative company and not afraid to break new grounds. 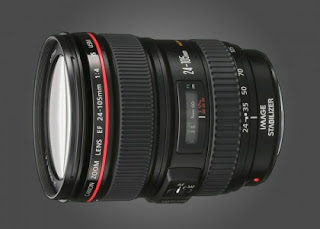 Canon needs to hurry up and release a few of their new lenses in 2013. 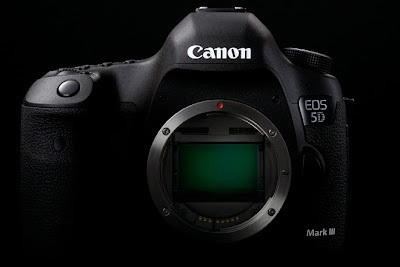 My sources informed me the expected Firmware 1.2.1 for the Canon EOS-5D Mk III is already being loaded on cameras coming into Canon Service Centers before being shipped back to customers. The official release date from Canon is on April 30, 2013. You can read my earlier post on this topic and watch a video from NAB 2013 on how the new Firmware works here. 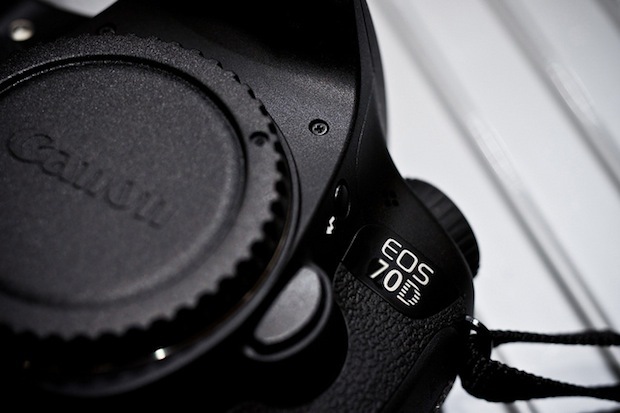 As the announcement of the Canon EOS-70D and EOS-7D approaches, more rumors are coming out. 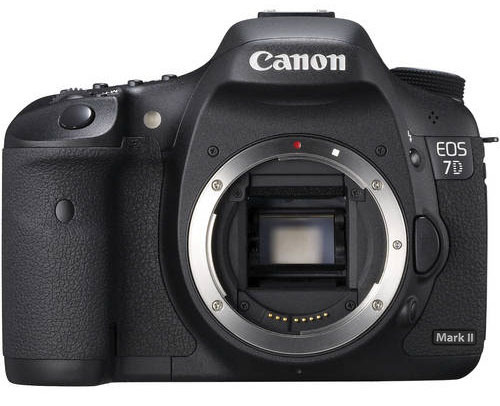 My own personal opinion is the EOS-70D will probably share the same sensor as the recently introduced Rebel SL1 camera but the EOS-7D Mk II will have a brand new sensor, probably around 21 MP. You can read my latest post on the upcoming EOS-70D camera here. Sigma has announced their 18-35mm f/1.8 DC HSM lens today. This is the world’s first lens that offers a fixed f/1.8 aperture throughout its zoom range. The fixed f/1.8 aperture breaks new ground in the camera lens industry, as the zoom lenses of Canon and Nikon top out at f/2.8. This Sigma lens offers more than a stop of extra light. Read the Sigma official announcement on their website, see sample images here and read a review of the lens here. 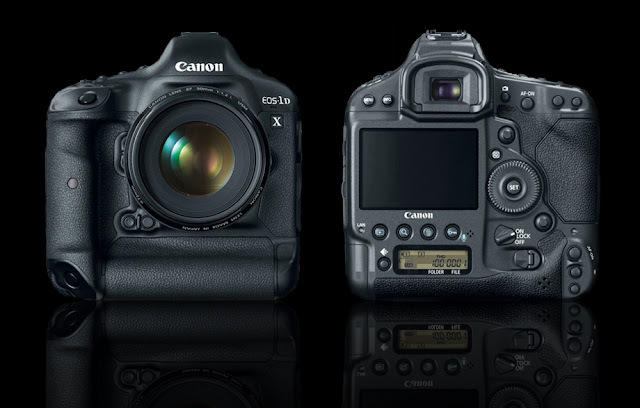 The Canon EOS-1D X camera, my pick for the best DSLR camera on the market is a bit more affordable today. Canon is selling refurbished models for $5,439. The list price is $6,799. Hurry, I can guarantee you the supply WILL NOT last. You can read my review of the camera here and read my post on buying factory refurbished equipment. Visit my website MichaelDanielHo.com to see photos taken from recent photo shoots with this amazing camera. The recently concluded NAB Show in Las Vegas, Nevada shed a bit of light on new Canon products and announcements coming up later this year. Chuck Westfall from Canon was doing video interviews and talking 'freely' about Canon and features on their new cameras and video products. 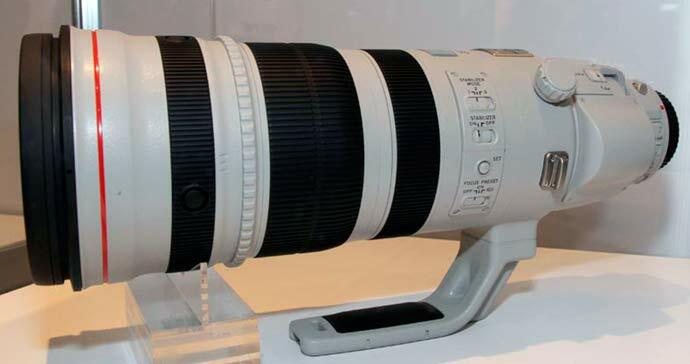 The long awaited EF 200-400mm f/4L IS 1.4X Super Telephoto lens also made an appearance. Apparently Canon has concluded their design on this lens and the finalized test versions are being manufactured right now before mass production begins. The expected launch date is late Summer to early Autumn of 2013. 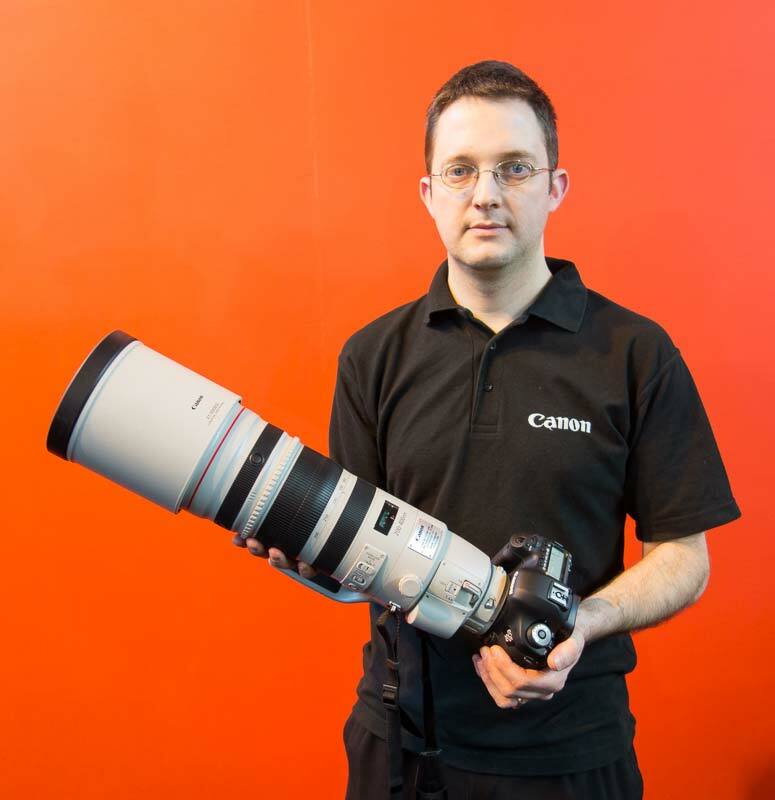 This is a big and rather heavy lens and the list price is expected to be over US $10,000. Read my earlier post and see the hands-on review of this pre-production lens in action. Canon announced the new EOS Rebel T5i/700D camera last month and now they are in stock and available for immediate shipment. You can read my earlier post on whether it is worth the upgrade from the EOS Rebel T3i or T4i. See my other post and download the Instruction Manual here. 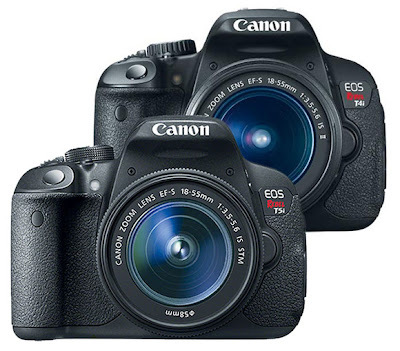 For a very limited time, the Canon EOS-7D camera is available from an online merchant located in Hong Kong for US $999. This is an excellent camera and has been my pick as the best camera value for the last three years. 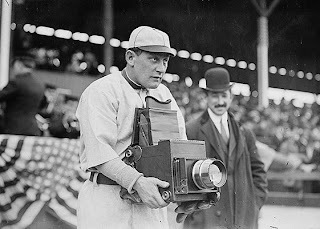 You can read my review of the camera here. I have no reservation in recommending this DSLR body. 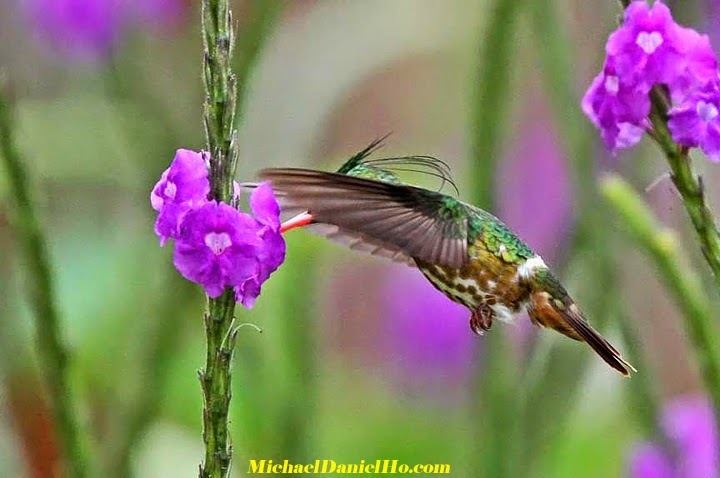 Visit my website MichaelDanielHo.com to see many travel and wildlife photos taken with this camera all over the world. 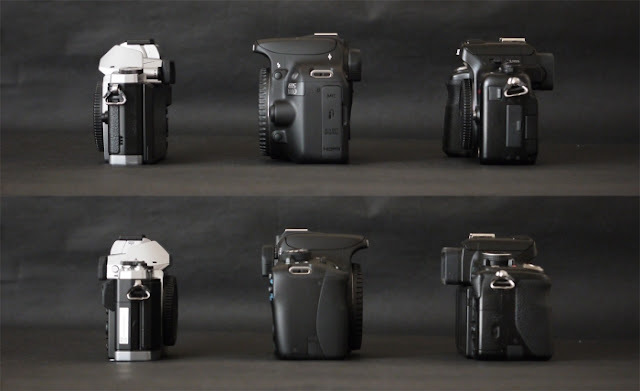 The world's smallest DSLR camera, the Canon Rebel SL1/100D is compared to two mirrorless cameras, the Olympus OM-D E-45 and the Panasonic DMC-GH2 by the Korean website DICAHUB. The tests also involved high ISO performance. 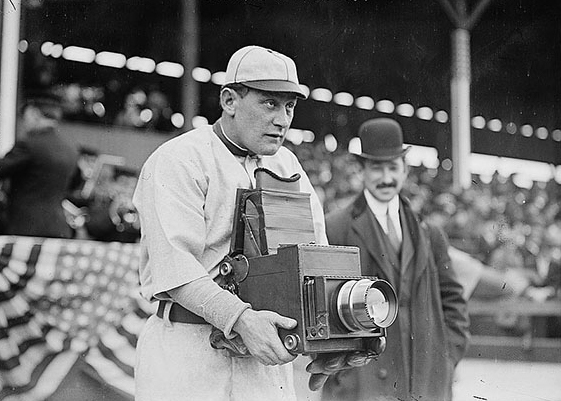 The Canon camera used was a pre-production model. You can see the images and read the translated article here. The Rebel SL1/100D is available for pre-order at your favorite camera store or online merchant now. The Instruction Manual is available for download and delivery should commence before the end of April, 2013.